Reduced costs as additional connectors do not need to be purchased. Less water flow resistance in a bent pipe rather than a connector joint - the smaller diameter the pipe, the more important it is to keep the number of connectors to the minimum. Removal of points of possible leakage - bent pipes do not leak, connectors may. Not only can copper pipe be bent to give right-hand bends (greater bends should be avoided as they tend to over weaken the pipe) but also less than 90° (where a pipe needs to be brought away from a wall to connect to an appliance) and into 'joggles' (swan necks). Pipe bending is a techniques easily learnt with a bit of practice but does need a few special tools. If a copper pipe is just forced to bend, the walls of the tubing will collapse and possibly rupture, it is therefore essential to use the correct tools to avoid this happening. 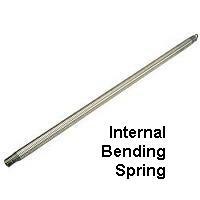 The simplest tool is the bending spring normally used for pipe bending by hand, two types are available - internal and external. Internal springs are just a spring made from flattened steel with a taper at one end (which is inserted into the pipe) while the other end incorporates an eye. With the spring within the pipe, the wall of the pipe is prevented from collapsing inwards as it is bent. Internal bending springs are commonly used for copper pipe from 12 to 22 mm external diameter (larger springs are available but are not recommended). A specific spring is required for each size of pipe being bent. External springs are for smaller diameter copper piping ( from 6 to 10 mm external diameter). Again they are made from flattered steel but with a 'funnel' at each end so that the copper pipe can be fed through the centre of the spring. With the spring surrounding the pipe, the spring prevents the wall of the pipe from spreading outwards as it is bent. As with the external springs, each pipe size requires its own specific spring. Most Plumbers tend to use bending machines as they are easier and quicker to use, they also enable multiple bends to be put in quite long runs of pipework. Bending machines are available from most tool hire shops but for the occasional, diy plumber, they can be tricky to set up and use. Various types are available (handheld or floor mounted being the most common) but they all work in the same basic way. The pipe is held at one end of a channel in a curved former and a shaped roller is used to force the pipe around the curve. As the point of bend is held between the former and the roller, the wall of the pipe is prevented from distorting. Different formers and rollers are required for each size of pipe. Bending machines are available to suit the full range of copper pipe from 6 to 54 mm external diameter - they are considered essential for pipes over 22 mm - thankfully most diy'ers will seldom need to work with these larger sizes. Before you start, tie a length of cord to the eye on the end of the spring, this will allow the spring to be removed from the pipe. Insert the spring into the pipe so that it is positioned evenly across the area of the required bend. If the spring is a tight fit in the pipe, rotate the spring anticlockwise as it is inserted - this will cause the spring to 'wind-up' so that it will have a slightly smaller overall diameter. If the pipe has been cut before bending, the end of the pipe may have become slightly reduced, don't try to force the spring, but carefully remove the burr so that the spring will freely enter. 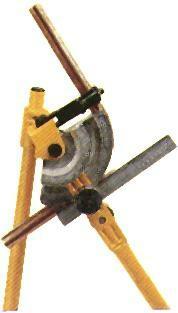 Some pipe cutters incorporate a vee shaped blade which can be used to remove these burrs. With the spring correctly positioned, the usually method with pipe up to 15mm is to place the centre of the bend across the knee and slowly pull both ends to form the bend. Slightly over bend the pipe, then reverse the pipe and bend it back to the required angle - this will release the pipe from the spring and make it easier to remove the spring. For pipe larger than 15mm, some people prefer not to bend around the knee due to the force which needs to be applied. In these cases (or for pipe under 15mm is necessary) the pipe can be bend around anything fairly solid with a curved surface greater than about 100mm (4 inch) radius. If possible, offer up the bend and adjust it if necessary to suit the installation. When happy with the bend, remove the spring from pipe, using the cord and/or rotating the spring anticlockwise as it is withdrawn if necessary. External springs are easier to use as they are used on smaller pipes and do not disappear inside the pipe. Just slide the spring over the pipe, rotating the spring clockwise if necessary to open-up the internal diameter. With the spring positioned centrally across the required position of the bend, slowly pull the ends of the spring to form the bend around the knee or suitable curved surface. Slightly over bend the pipe and then reverse the pipe and adjust to the required bend radius - this will free the spring from the pipe. Remove the spring by sliding it along the pipe, rotating it clockwise to open it up if necessary. Rather than completely removing the spring, the spring can be moved along the pipe so that it can be bent in another place. Always read the instructions for the bending machine before using it; each machine is different although they use the same basic principal. These notes are for general guidance only. Make sure that the correctly sized former and bending roller are fitted to the machine; one size of former/roller will only bend one size of pipe. Place the pipe in the the machine, remember that the pipe is secured at one end, so carefully measure from the centre of the former so that the bend is formed in the required position of the pipe. Use the lever handle of the machine to apply roller pressure to the pipe and form the pipe around the former. Move the lever smoothly until the required bend is achieved. The pipe will tend to spring back a certain amount when the pressure is released but be carefully of over bending as this is not always easy to recover it. Release the pipe from the machine.